Much like the Jetlag version, the 1956 version of Hunchback follows the book pretty faithfully. Sure, they add things, remove things and combine things but this version is the most faithful known movie version. It starts with the theme of Anankh which they says means as “evil destiny.” Bit heavy-handed but at least it’s there in the movie. From there the movie follows the book. We have the Feast of Fools, Gringoire’s failed morality play, Esmeralda dances, Frollo is a preist who stares, Quasimodo is named King of Fools, Clopin begs, the kidnapping, Gringoire and Esmeralda are married, Phoebus is a sort of jerk, Frollo practices alchemy Djali spells, and we get that vault ending where after Esmeralda dies and placed into the vault at MountFaucon Quasimodo goes in and lays down beside her to die. Pretty much the plot of the book is let intact. Of course there are somethings that were changed. First one, no Sister Gudule and Esmeralda is a Romani. Not the biggest change as movie versions either don’t use this plot or handles it poorly. The second is that Frollo’s confession jail scene and the red door scene are merged. Personally, I love the jail scene it gives Frollo more characterization and the 56 Frollo would have been enhanced by it but again not a big deal I just wish it had been there. However one change that is big is the suspension of Sanctuary. In the book Frollo tells Gringoire that Sanctuary is going to be suspended so that Esmeralda can be his power but this was a lie. However is turned into reality when the Court of Miracles fell for it and rallied to save Esmeralda but the King thought that they wanted her death and then suspended it. In this version Frollo gets the King to suspended it and the Court tries to save her. So the beggar are not tricked they try to save and they ultimately fail. Unlike other versions this is the first known version where Esmeralda dies. However unlike the book her death is different. 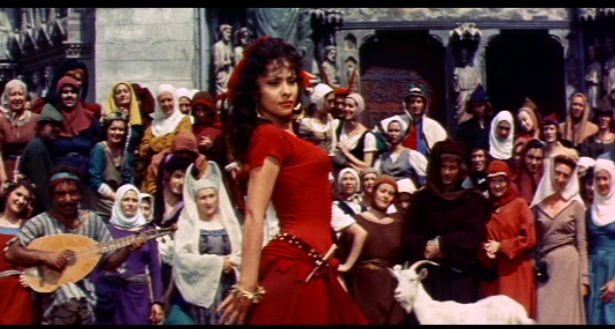 As the Court of Miracles attacks Notre Dame and Quasimodo defends it, Esmeralda goes to the door and meets the Court. They triumphantly carry her out but then the King’s guard fire arrow at them. Esmeralda turns to run back inside Notre Dame but she is shot by an arrow and dies. It’s admirable that this version follows the book pretty faithfully but like also like the Jetlag version it’s plague with problems that hinders the overall quality of the movie. 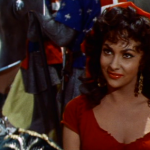 Next Article for the 1956 version- the character starting with Esmeralda.